The original PolyTune by TC Electronic was a great innovation and has been popular since it first came out. 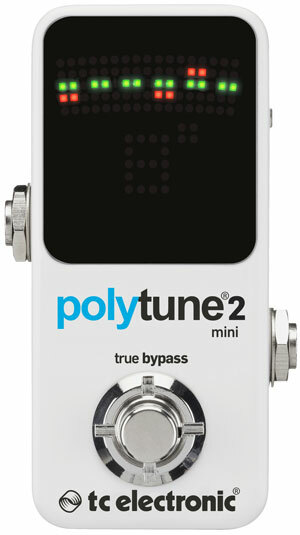 This review will look at the PolyTune 2 Mini which is a tiny version of the recent PolyTune 2. There are some important differences so have a read through to see which option suits you best. Let’s start by looking at the features on the PolyTune 2 Mini and at the end of this review, we will look at how the Mini compares to the larger PolyTune 2. This is the feature that sets the PolyTune apart from other tuners. The basic idea is that you can strum all six strings and instantly see which ones are or aren’t in tune. 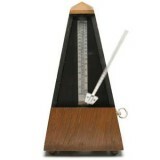 There are other polyphonic tuners available today, but it was the PolyTune that got it right first. In the photo to the right, you can see the polyphonic mode active in the display. Many guitarists prefer strobe tuners to regular needle based tuners as they can be far more accurate. In the PolyTune 2 Mini the accuracy of the strobe tuner is +/- 0.1 cent compared to the chromatic mode which is +/- 0.5 cent. To put that in perspective, 0.1 cent is 1/1000 of a semitone. So if you use the strobe mode properly, you can potentially tune your guitar to within one-thousandth of a semitone of the exact pitch. For practical purposes that’s as perfect as anybody would ever need. Not everybody likes strobe tuners because while they’re more accurate, they can feel a bit strange to use. So if you prefer the standard chromatic tuner with a moving needle, the PolyTune 2 Mini also has a chromatic tuner mode. As you can see you won’t achieve the same accuracy as the strobe mode, but again for practical purposes, 0.5 cent is more than enough for most purposes. Not everybody uses standard tuning and the PolyTune 2 Mini does offer alternatives to suit different tunings – as long as they’re all based on standard. So for example, if you play in Eb standard (Eb Ab Db Gb Bb Eb), you can set the pedal to one semitone lower and it will recognize Eb tuning when you strum all six strings. Pushing the tuning button (on the side next to the power input) allows you to cycle through tunings one semitone at a time. So you can set the tuner to recognize your tuning all the way to 5 semitones lower than standard. That means you can tune all six strings down to B standard which would be useful for guitarists using seven strings to pick up on the low B.
Alternatively, the pedal can be set to recognize higher than standard tuning which is useful when you’re using a capo. You can place a capo anywhere up to the seventh fret and set the pedal to tune your guitar with the capo on. Keep in mind that this feature only applies when you tune all strings down so if you use a tuning such as Open E, it won’t work in polyphonic mode – you would need to still use one string at a time using the chromatic tuner. This is a great feature as many guitarists use Drop D as their usual tuning. To activate Drop D mode you press and hold the footswitch for three seconds. “DROP” appears on the screen and the pedal then stays in Drop D mode. You always know if you’re in Drop D mode or not as there will be a little ‘d’ displayed on the bottom of the screen. Switching back and forth between Drop D and standard is as simple as holding the footswitch down for three seconds. Very handy for live guitarists needing to change tunings between songs. This is an improvement over the original PolyTune. The LED display automatically adjusts to the situation you’re in due to the light sensor. So if you’re in a dimly lit gig it will adjust the brightness down compared to if you’re outside it will increase the brightness to be seen in full sunlight. Struggling to see a display in full sunlight is a common issue with other pedals and the PolyTune 2 Mini was perfectly clear when I tested it in sunlight. This is an important feature to consider because some guitarists prefer to use a buffered tuner at the start of their signal chain. If you don’t know the difference between True Bypass and buffered pedals, read this guide. Whether you want a tuner with True Bypass or not depends on a lot of factors. The main factor should be how long your pedal chain is and how many of those pedals use buffers. If you only have a couple pedals in your chain this isn’t something to even think about – True Bypass will be perfect. Likewise if you have a long pedalboard, but one or two of those pedals are buffered (eg: any BOSS pedal), then again you shouldn’t worry about your tuner being True Bypass. The only time you should really think about having a tuner (or at least one other pedal early in the chain) with a buffer is if all your pedals are True Bypass. I would say for most guitarists the benefit of having a buffered tuner is insignificant compared to the benefit of having a True Bypass pedal. This should be expected when you see how small the PolyTune 2 Mini really is. There’s definitely no room in there for a 9V battery so you will need an external power supply. The larger PolyTune 2 does allow battery usage so if you don’t like using external power supplies this is something to keep in mind. A tuner should be simple to use and the PolyTune 2 Mini is nice and simple with one footswitch, no control knobs and only one tuning mode button on the side. The display can be very bright and having it automatically adjust to the ambient lighting is a great feature. You can see six columns (two LEDs per string) indicating the tuning for each string. So for example you can see the low E string and the G is slightly low and the B is slightly higher as indicated by the red LEDs. If your string is way out, the green LEDs will disappear and the red LEDs will move further away from center. This is a well-designed display because it instantly tells you what strings you need to adjust. Once you figure out what strings to adjust, you can simply work on one string at a time like you would with a standard tuner. As soon as you play one string, the pedal will switch to monophonic mode. You can set it to either strobe (right screen) or chromatic mode (left screen) depending on your preference. You set the mode by holding the tuning button down. Once you have it set to either strobe or chromatic, you use it like any other tuner (you can go back to polyphonic mode at any time by strumming more than one string). The automatic switching between polyphonic and monophonic modes is what really makes this an easy pedal to use. You don’t need to hit a button or switch – just strum or pick the strings depending on what mode you want to use. Changing to Drop D tuning was extremely simple by holding down the footswitch for about three seconds. I can imagine this would be very useful for a lot of guitarists who regularly need to switch back and forth between standard and Drop D tuning. Changing the pedal to a lower tuning or capo tuning means you do need to bend over and push a button a few times to select the right tuning, but it’s pretty straightforward. I don’t imagine many guitarists needing to do this during live use so it’s a good system. You push the button and your current tuning will display (eg: — E — displays for standard tuning). Then you can cycle through the tunings to find the one you want to use. For example, if you want to have a capo on the third fret, you would cycle through until you find ‘G 3’. Once you stop pushing the button the display flashes twice to confirm the tuning and it stores it. It’s important to know that even after you power off the pedal, the last tuning mode you selected will remain saved. So next time you power on the pedal it will still be in the same tuning mode. This is great for guitarists who always have their guitars in a lower tuning as it means you won’t need to reset it every time you power up the pedal. It’s important to talk about True Bypass at this point. It should go without saying that a tuner should not affect your tone. But there are many tuners that do affect your tone due to the fact that they use a buffered bypass. 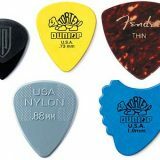 There are reasons why you might want to use a tuner with a buffered bypass, but with higher quality pedals and gear available today, there’s less reasons to do so. Some guitarists use a BOSS tuner as a way to insert a buffer into their chain and if that’s the setup you use now, it’s important to know that the buffer is affecting your tone. If you were to switch to using the PolyTune, that buffer would be removed and your tone would pass straight through unaffected. If you cram your pedals together on a pedalboard the button is a bit awkward to get to and really should have been on the face or on the end rather than the side. But that’s a minor complaint as you’re rarely going to need to use that button. 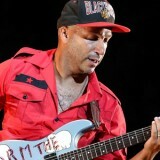 There are a lot of guitarists who still use a BOSS TU-2 or TU-3 as their main tuner. In the past, I could see why those tuners were worth using but today it’s not as clear. When you compare the TU-2 against the PolyTune 2 Mini, I find it hard to come up with any reason to choose the BOSS over the PolyTune. The PolyTune 2 Mini has more flexibility, a better display with better features and is really easy to use. I know there are some guitarists who will prefer to use a buffered tuner but I’m finding less and less guitarists who really have a need for a buffered tuner. 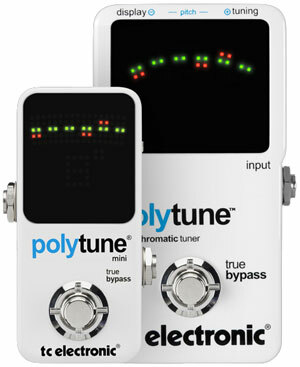 I recommend the PolyTune 2 Mini for my students and I highly recommend it to any guitarist. The reality is you don’t need to spend hundreds on a tuner – this pedal will give you a practical perfect tune for a far lower cost than a lot of alternatives. I’m having trouble thinking of any reason not to use the PolyTune so if you’re looking for a tuner pedal, this is a great choice. Check out the PolyTune 2 Mini price and full details here (link to Amazon). Every guitarist needs a tuner. Whether you buy a dedicated tuner depends on your needs. If you don’t have a pedal tuner and currently use a handheld tuner – then this is worth considering. If you play live, this is one the best choices available today. The bright display and the different tuning modes will give you plenty of flexibility. Being able to easily switch between Drop D and standard tuning mode is a handy feature. If you currently own a BOSS TU-2 or TU-3, this honestly is a massive upgrade in precision and ease of use. 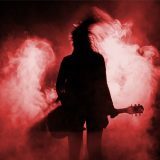 I’ve already read countless posts online from guitarists who reluctantly tried the PolyTune and once they switched over they never looked back. If you use a multi-effects unit with an inbuilt tuner, I don’t really see any reason to buy another tuner pedal. It will just take up space and add in additional power requirements. While the PolyTune 2 Mini works perfectly using any pickups, to get the best results, use your neck pickup. Tuners tend to work best on a neck pickup and if you use your thumb to strum the strings it will also help out. Get used to tuning the strings while in polyphonic mode, then see how close you got by picking individual strings to switch to monophonic mode. This will show you whether you can achieve the accuracy you’re looking for while in polyphonic mode or whether you’re better off to work on each string separately in monophonic mode. If you haven’t used a strobe tuner before, I recommend practicing with the strobe mode. It does take some getting used to, but you will find it’s far more accurate. Some guitarists prefer to stick to the traditional needle display and that’s fine. But I recommend at least trying to use the strobe mode before dismissing it. You might change your mind on it and prefer using it. If you feel you want those features in addition to the features available in the Mini, the PolyTune 2 would be a good alternative. You may have heard about the Noir. It’s the exact same pedal in a black casing. So if you like the features in the PolyTune 2 Mini but want a black pedal to suit your pedalboard, check out the PolyTune 2 Noir Mini.